Not only is the use of nuclear weapons immoral, the conditions that allowed the Catholic Church to tolerate nuclear deterrence no longer apply, the Vatican representative to the United Nations said in little noticed speeches in Washington and New York City. Archbishop Celestino Migliore spoke at forums sponsored by the Woodstock Theological Center, which is based at Georgetown University. The forums took place on March 16 at Georgetown University and on April 13 at St. Ignatius Church in New York City. At the forums, the nuncio laid out the moral case against nuclear weapons. In the past the use of nuclear weapons was condemned by the church, he said, but nuclear deterrence was granted conditional acceptance during the Cold War. It was always difficult for the church to accept deterrence. Both conservative and liberal moralists asked: How can it be moral to threaten to do something that is immoral? Acceptance of deterrence was conditioned on 1) the sole use of nuclear weapons for deterrence against nuclear attack, which means renouncing their first use, especially against nonnuclear threats; 2) limiting the number and kinds of weapons to those sufficient for deterrence; 3) moving toward progressive nuclear disarmament. To the extent that a nation's nuclear policy strays from these conditions, it would be judged morally problematic. Since the end of the Cold War, there has been some reduction in the number of nuclear weapons, but rather than foreswearing first use, nuclear powers have upgraded their weapons to make them more usable. "Nuclear weapons are no longer just for deterrence but have become entrenched in the military doctrines of the major powers," Archbishop Migliore said. "A war-fighting strategy using nuclear weapons has been put in place." While acknowledging that the recent US Nuclear Posture Review "seems to move toward less emphasis on nuclear weapons," Archbishop Migliore said, "Nevertheless it describes the role of nuclear armament to deter a nuclear attack as fundamental albeit not the sole one." Archbishop Migliore told the Woodstock forum audiences, "The conditions that prevailed during the Cold War, which gave a basis for the Church's limited toleration of nuclear deterrence, no longer apply in a consistent and effective manner." "Clearly the conditions for the moral acceptability of deterrence are not being met," concludes Gerard Powers of Notre Dame's Kroc Institute, a leading Catholic thinker on these issues, in the May 17 issue of America. He argues that nuclear disarmament "is not a utopian dream but rather a realistic policy objective that can be achieved." The Catholic Church has been speaking out on nuclear issues over the past couple of months, but its message has been drowned out by media coverage of the sexual abuse crisis. On April 7, the Vatican newspaper praised the U.S.-Russian disarmament treaty (START II) as a "significant and courageous step toward international security." L'Osservatore Romano agreed with President Obama that the major nuclear threat now comes from terrorists not from any country. At his weekly general audience on May 5, Pope Benedict XVI called on world leaders to work to stop the spread of nuclear weapons with the goal of complete nuclear disarmament. "I encourage the initiatives aimed at progressive disarmament and the creation of zones free from nuclear arms in the prospect of their complete elimination from the planet," he said. The Vatican would especially like to see the Middle East become a nuclear free zone. Likewise, the U.S. bishops welcomed the signing of the new Strategic Arms Reduction Treaty and urged bipartisan support for it in the U.S. Senate. "Based on a moral imperative to rid the world of nuclear weapons," said Cardinal Francis George, "the Conference of Bishops will be a steadfast supporter of strong and bipartisan action on the new START Treaty as an important and essential step toward a nuclear-weapons-free future." In his April 8 letter to President Obama, Cardinal George also supported passage of the Comprehensive Test Ban Treaty and strengthening the International Atomic Energy Agency to monitor nonproliferation. "What the church rejects is the widely held view that nuclear weapons bring security but nuclear disarmament would bring insecurity," say Powers. Granted how technology has failed us on Wall Street and in the Gulf of Mexico, basing our security on nuclear weapons is very scary. If your only source of news on the Catholic Church is the secular media, you might think that sexual abuse by priests, abortion and gay marriage are the only topics of interest for the church. These are certainly legitimate topics for the media, but we should not ignore the Vatican and the U.S. bishops when they speak out on important issues of justice and peace. 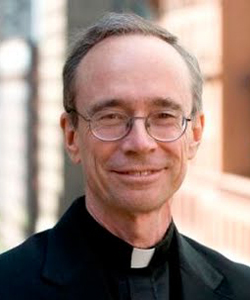 As a contributor to the Washington Post's Georgetown/On Faith site, Father Thomas Reese, S.J., explored the multifaceted life of the Catholic Church, particularly American Catholicism.